Getting and staying organized is all about designating where things go. That holds true for shoes, coats, power tools, keys, mail and anything else that is considered “floating” around your house. Once you’ve designated the drop off areas for those items, you and your family should get into the habit of putting them down in those spots. The other level of organizing comes when you tackle spaces like your closet or garage. 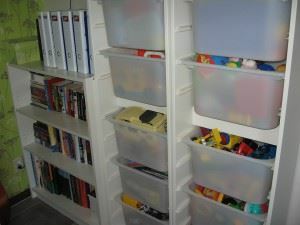 This is where you need to do a bit of sorting before you can organize. In other words, you decide what you can throw out. That can create a huge pile of rubbish. When that happens, the only option is to call in Junk King Nashville. The two-man crew assigned to your junk removal task by Junk King Nashville are all about picking up stuff from right from the spot. That means you don’t have to bring anything outside to put onto the truck. That also extends to bring stuff down from upstairs or up from the basement. You’re hiring this crew to do all the work and that includes climbing stairs. It also includes lifting and loading any object regardless of size or weight. Without those limitations just imagine what you can finally get rid of around your house. Everything collected by Junk King Nashville also has the opportunity of getting put back into circulation. Whether it’s an old sofa or outfit from your closet Junk King Nashville will see to it that it gets dropped off at those charitable organizations that can put it to once again. The good about getting rid of some of your items because nothing has to go to waste. The cost for this service will be determined by the Junk King Nashville crew once they’ve had a chance to look over all the things you want to load onto the truck. It’s actually how they will pack up that truck that will determine the final cost. There to provide you an estimate that reflects that amount equal to one third, one half, one quarter or the whole truck. It’s all about the volume and not about the weight. The best approach to getting organized is hiring Junk King Nashville. Make that call today. This entry was posted in junk removal on December 31, 2016 by Robert Hatcher. Last updated August 16, 2017 .